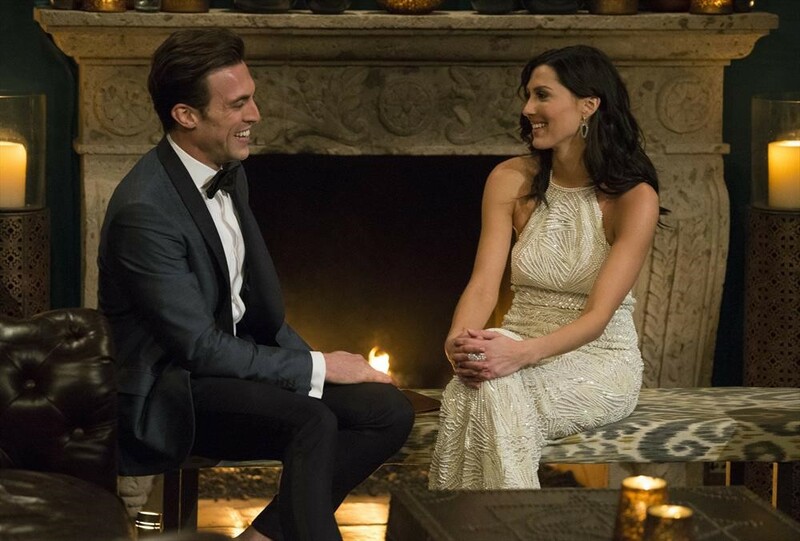 NEW YORK -- Season 14 of "The Bachelorette" with Becca Kufrin began with her crying over Arie. The show recapped Arie's proposal on "The Bachelor" to her and their agonizing unedited breakup. Poor Becca was expecting a fantasy date, only to be broken up with in front of a camera crew. Becca went back to Minnesota and tried to get her life back in order. Her family consoled her and helped her to heal her heart. So now, she's "The Bachelorette!" She says she's ready to find someone who will love her and treat her the way she deserves. Arie even got banned from the state of Minnesota for breaking her heart! "Let's do the damn thing!" Get ready to hear that way more than you want to this season. I think they should have polled "Bachelor Nation" on whether or not we liked that phrase or not. Becca zipped off in a red convertible to meet up with previous "Bachelorettes" Jojo, Kaitlyn and Rachel. All three are still happy with the men they chose! So, that's great news! They gave her a pep talk ahead of meeting all of the men and they all told her to think of what will work for her in real life. "Trust your gut!" That's the message from all three. They took out some sage and they got rid of the bad energy inside Bachelor Mansion. It was pretty funny! They noted that all of their first impression roses resulted in being the men they picked, so we'll have to see if that rings true for Becca! Becca looked stunning in a white beaded dress. But before we could see the limos arrive, we had to "meet" a few of the men in their video introductions. Clay is a 30-year-old professional football player from Chicago who used to play for the Philadelphia Eagles, Jacksonville Jaguars, New England Patriots and the Detroit Lions. He helps take care of his elderly grandma and he loves to hang out with his family. His dad is black and his mother is white, and he says he's proud of his biracial family and their rich heritage. He seems very sweet. Garret is from Reno, Nevada and he's 29-years-old. He works as a sales rep and loves to joke around. He loves outdoor sports like fishing, snowboarding and hiking. He's looking for a special lady to share all of those experiences with. Jordan is 26 and a professional model from Florida. He's pretty impressed with his looks. He seems very self-involved. He wants to share his good-looking self with Becca. Lincoln is 26 and originally from Nigeria. He's an account sales rep that lives in California now. He says he's ready for marriage and he'll be a great husband. Joe is 31 and he owns a grocery store in Chicago. He seems like a hard working man, but he says he has bad luck in love. His parents have been married for 35 years and he wants what they have. Jean Blanc is 31 and from Haiti originally, but now he works as a connoisseur (in what, who knows) in Florida. He collects watches, ties, colognes and other fragrances. He wants to take Becca's heart by storm with his scent. Colton was born on Super Bowl Sunday and played for the Chargers. He's 26 and his career is over already because of an injury. He has a little cousin with cystic fibrosis and now he runs a national charity to help children and adults with the debilitating condition. He seems like a standup guy for sure! Next up, the limos! Becca arrived first to have a chat with Chris Harrison about what she was looking for and what she could expect on this journey. The first limo pulled up, and Colton was the first man out. He gave Becca a confetti popper and they got the party started. Grant was up next from California and he told her he respects what she went through. Clay told Becca she looks amazing and said, "I'm Clay and I play football." Becca thought he seemed nervous. Jean Blanc was out next and they said "Let's do the damn thing," in French. Connor a 25-year-old fitness coach had her close her eyes and gave her a little proposal about being ready to "do the damn thing." This is getting old fast. Limo 2 arrived and Joe told Becca that she looked amazing and then they just talked about how good he looked. John told Becca that love can happen overnight because that's what his grandmother told him. He then almost walked in the wrong way. Leo and Becca hugged and he's got some crazy hair. It's likely because he works as a stuntman. He let his hairdown and Becca said that it looks like her sister's hair. Male model Jordan came out of the limo and it was just a little awkward. Rickey also wore a gray suit to Jordan's dismay because he thought it would make him look original. Jordan revealed to the guys that he spent six hours picking out his outfit. The tapping of the shoes are the "heartbeat of a gentleman," Jordan said. This guy's going to be entertaining. Alex is 31 and a constrution manager, and Becca liked his tie. Nick is a 27-year-old attorney but wore a racing outfit. He took it off and revealed his suit. It was a little weird but he looks pretty cute. Mike wore a man bun and brought out a cardboard cutout of Arie. He's 27 and a sports analyst. He said he wanted Arie to see how happy Becca was that night. What?! It kind of creeped Becca out. A minivan pulled up and it was Garret! He said that one day he hopes to be a great dad and husband. He showed her the inside of the van that had a diaper bag, soccer balls and carseats ready to go. They laughed a lot together! "Oh my God, that was good!" Becca said. She liked his introduction. Blake rode up on a bull! On "After the Final Rose" he rode up on a horse. Becca remembered him right away. He told her that he couldn't keep her off his mind. He told her she was "as strong as an ox." That's what every woman wants to hear. Becca thought he was a cutie though! Lincoln was out of the limo next and they shared some chocolate birthday cake. He was also from the live show! Chase and Darius had met her before as well. She remembered Ryan with his banjo and the other guys were jealous of the men who had met her before. Another limo pulled up and Christon a former Globetrotter got out, Wills had some amazing red shoes on and they talked about their nerdiness, while Jason taught her his special handshake he shares with his friends. Kamil asked Becca to come to him so they could meet half way, and then said how about 60-40. Ok he's not her type. Jake from Minneapolis came out of the limo and Becca knows him! He's an acquaintance and now he's there! She thinks it's very weird. Then a hearse showed up. They opened the back up and Trent told her that when he heard she was "The Bachelorette" he "literally died" but then she brought him back to life. Christian the banker spun her around. Cue the chicken! He came out clucking "Becca!" David is the man in the costume and he punned his way through his introduction. Chris said that he wants to win over her Uncle Gary's heart and it was by introducing Becca to an entire church choir! That's pretty memorable! That's it, that's all 28 of them. It was finally time for Becca to go inside and "Do the damn thing!" Becca is very hopeful that her husband could be among them. Connor was the first guy to steal her away and opened a bottle of champagne with a knife. He classed it up by drinking straight out of the bottle. 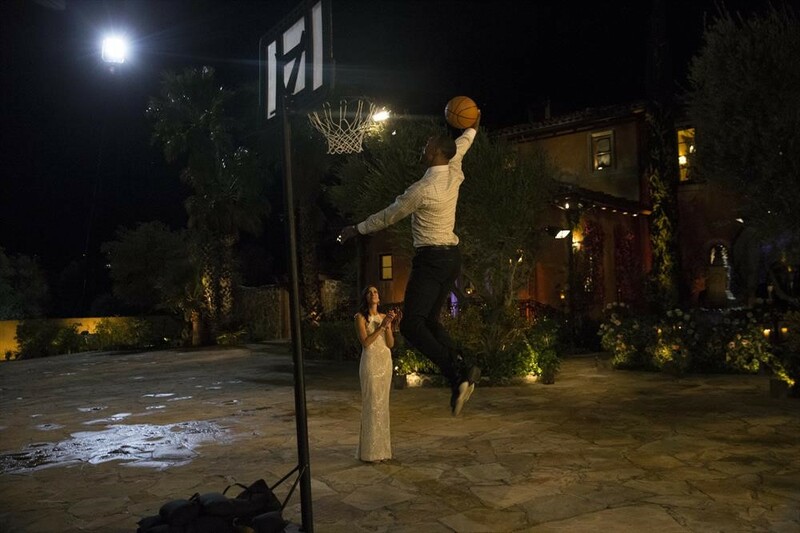 They talked about what a whirlwind of an experience it is to be on "The Bachelorette." Clay took Becca aside and made her play with clay so that she'll remember him. He talked about how growing up in a small town shaped him and that football doesn't define him. Yet, the first thing he said to her out of the limo was "I play football." They made some very funny figures of each other out of clay. One of the guys there, even created the app for Venmo! Chris told Becca that his parents have been married for 58 years and he said that he totally believes in the process. He seems extremely intense and is very serious. He kind of reminds me of Danny Wood from "The New Kids on the Block." Christon then took Becca out to the basketball hoop and taught her how to spin the basketball. If that wasn't thrilling enough, he had her hold the ball over her head and then ran, jumped, grabbed the ball out of her hand and did a slam dunk! Then the guys all played basketball and Becca said, "Oh my God so many balls, so many balls!" Someone taught her dancing, another guy read her a heartfelt poem, but she did seem to make a connection with Blake. They talked about their heartbreak and were on the same page in life. Chris Harrison walked in and slyly put the first impression rose on the coffee table. 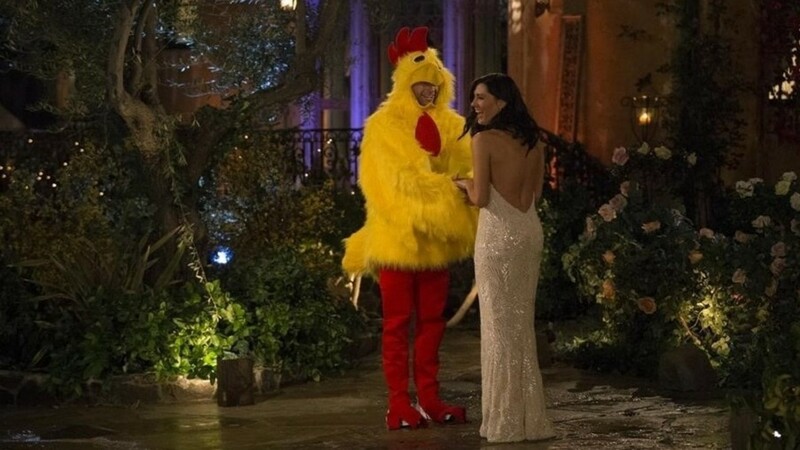 Of course, the chicken did the chicken dance with Becca. David really did make a good impression though! She loved how he could be serious and silly. Garret taught Becca how to fish in the pool. He gave her a sparkly fly for fly fishing. Becca loves doing the same things that he does like fishing and hiking and she says that he reminds her of home. That's huge! Chris said that Chase isn't there for the right reasons because he knows his ex. She texted him saying that all he does is hang out with his boys and he wants to revamp his company. So Chris is going to investigate. What a disaster, it's not his place. I mean what does he think Chase is going to say? Chase said he only hung out with her for a month and that it wasn't anything serious. So now he wants to get ahead of the problem and Chase tells Becca what Chris said to him. Chase calls Chris over to talk about the situation with Becca. After the discussion, Chase told Becca that he's there for her. Becca asked Jake why he's there since they've always just been acquaintances. For some reason Becca just can't believe his intentions. She said that she knows what it feels like to be with someone who isn't in it all the way. He said that he is a new Jake and that he isn't who he was a year ago, but Becca said that she just can't trust what he says. With that, she sent him home. 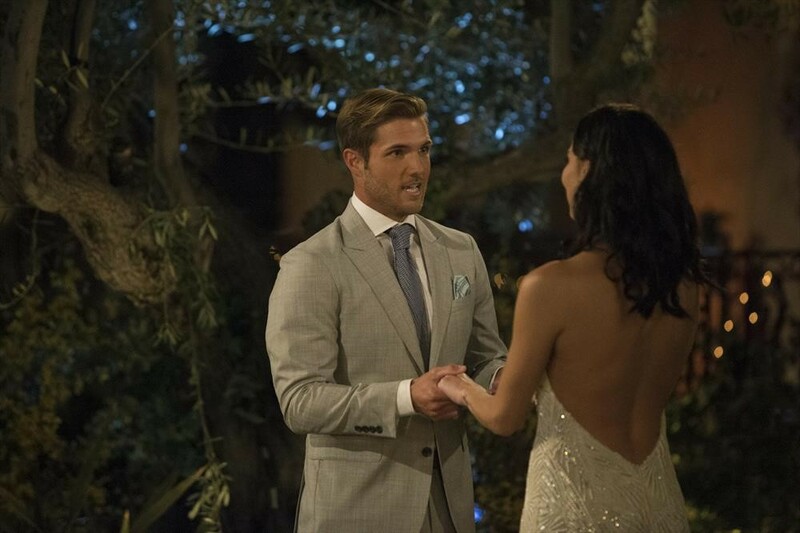 Anyone else want to see Jake in "Bachelor in Paradise?" I think there's more to this guy than we got to see! That threw the guys for a loop that she just up and sent someone home. Becca is not wasting any time. She decided the time had come to hand out the first impression rose. Becca asked Garret to go and talk and all of the other guys were instantly disappointed. 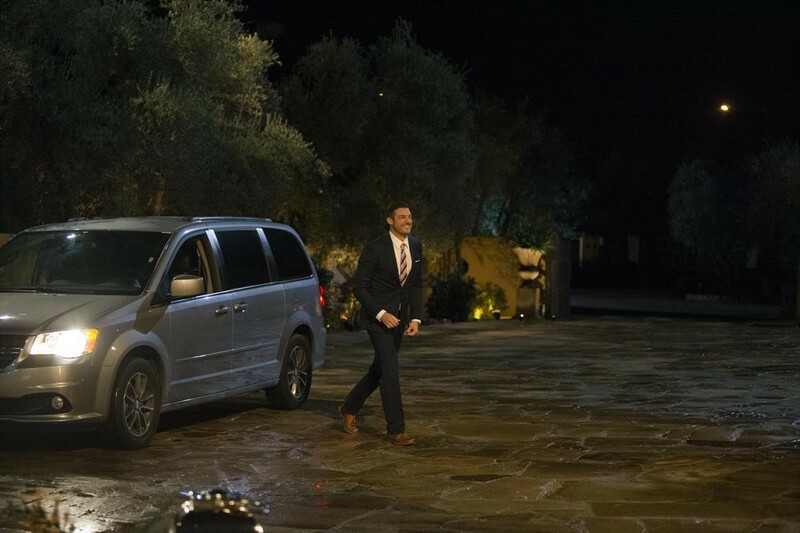 He was so excited to accept the rose and Becca says that she is smitten, especially since he rolled up in a minivan! Aw! Garret said, "I'm the luckiest guy in the world right now!" So that meant that among those going home were Chase ,who Chris called out, and Joe with the grocery store. The preview of the season shows Becca traveling the world with her guys. There's adventure, competition, love and of course drama! It looks like the "Right Reasons Police" goes after Lincoln who is a liar apparently and Jordan who is all about his "face" and "image." Colton says that he's a virgin and people apparently don't believe him. I guess we'll learn the truth at some point!